With just a tap of the hand, This 29 Inch Balloon sings "You're the one that I want, you're the one that I want, you're what I need, oh yes indeed...". This Jumbo size balloon is filled with helium and will play up to 50 plays approximately 20 seconds long. Option #1a: A simple but cute arrangement including the 29" Jumbo Shape You're The One Sing-A-Tune Balloon, attached to Valentine's Chocolates and four Love Coupons in a gift bag, $25. Option #1b: A Stunning Bouquet including the 29" Jumbo You're The One! Sing-A-Tune Balloon, a mix of Nine-11" Decorator and Solid Colour Latex Balloons attached to a Foil Weight, $37. Option #2: This bouquet arrives with the 29" Jumbo You're The One! Sing-A-Tune Balloon, Five-18" Solid Colour Foil Balloons attached to a Foil Weight, $40. Option #3: This bouquet arrives with the 29" Jumbo You're The One! Sing-A-Tune Balloon, Nine-11" Decorator and Solid Colour Latex Balloons attached to a 5-6" Valentine's Plush, $42. Option #4: This bouquet arrives with the 29" Jumbo You're The One! 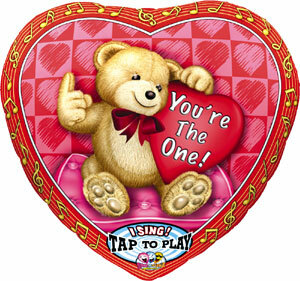 Sing-A-Tune Balloon, Five-18" Solid Colour Foil Balloons attached to a 10-12" Valentine's Plush, $48. Option #5: This bouquet arrives with the 29" You're The One! Sing-A-Tune Balloon, Seven-18" Solid Colour Foil Balloons attached to a gift bag full of candy, cookies and chocolates, $66. Option #6 ~ For the Special Lady: This bouquet arrives with the 29" You're The One! Sing-A-Tune Balloon, Four-18" Solid Colour Foil Balloons and Seven-11" Decorator and Solid Colour Latex Balloons attached to a Wooden Treasure Box filled with Upper Canada Bath & Body products, $78.